American baseball is a serious business--who knew it was a tool of diplomacy? In case anyone is wondering (as they should) how it is that baseball came to be a significant element in a number of Caribbean national culturesCuba, Dominican Republic, Puerto Rico, Nicaragua, Panama, Venezuela, etc.University of San Francisco mentor Robert Elias (Baseball and the American Dream, The Deadly Tools of Ignorance) illuminates the relationship of our former national pastime and U.S. diplomacy in The Empire Strikes Out: How Baseball Sold U.S. Foreign Policy and Promoted the American Way Abroad (New Press). Historically, being a conservative sport ( remember the brouhaha when the Baseball Hall of Fame cancelled the appearance of Bull Durham stars Susan Sarandon and Tim Robbins in 2003 for speaking out against the Iraq War? ), baseball’s infiltration into the U.S.’s neighbors as an adjunct to our various military incursions and misadventures should come as no surprise (John Krich’s El Beisbol: Travels through the Pan-American Pastime is also a valuable account on this subject). The degree to which beisbol took hold may besomething I noted when I traveled to Nicaragua in 1989 to attend their World Series (which they modestly called their national tournament) in the midst of a bitter war sponsored by the U.S. Elias relates how the Washington-backed Contras attacked truckloads of native hardwoods headed to Nicaraguan baseball bat factories so the Sandinistas couldn’t use the game to boost morale. 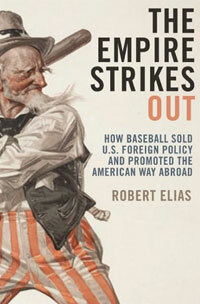 Elias makes excellent use of numerous anecdotes like the one above to enlighten baseball fans and students of the game of the long standing racism, jingoism, unbridled militarism, and insensitivity to other cultures (to quote Roger Kahn), which, of course, makes it a perfect fit with the story of what William Appleman Williams has termed the tragedy of American diplomacy. Good stories and nimble prose along with original research (Elias debunks the myth that baseball is uniquely American) and (mostly) shrewd analysis and appropriate historical revision(forgive me) this book hits it out of the park.